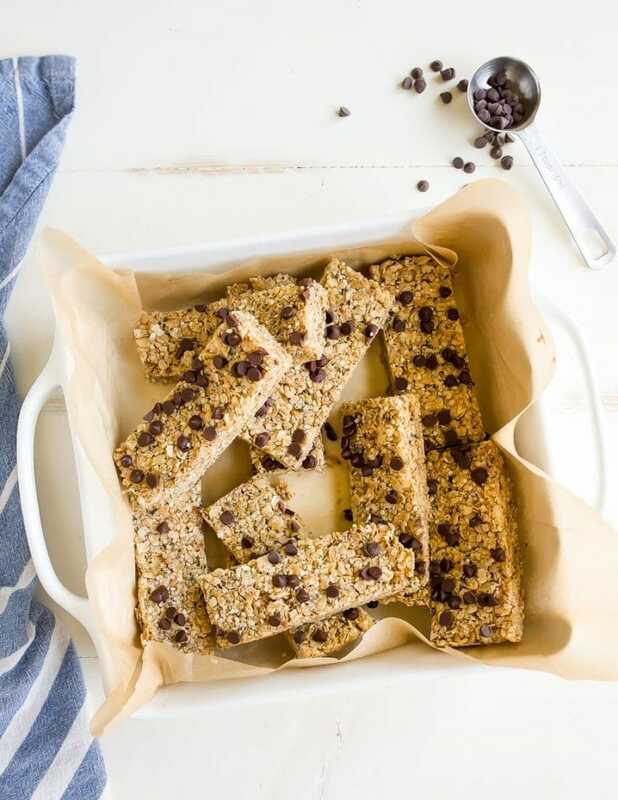 Vegan protein bars recipe made with hemp seeds; no protein powder here! My endeavors to get my toddler to eat protein are never-ending. Mamas, are you with me? If you’re new, let me fill you in: my kid struggles to eat any source of protein beyond eggs. However, she will eat salmon (have you seen my kid-friendly salmon fish sticks in my 3-ingredient recipe collection for toddlers? ), and she adores shrimp for one reason: they’re PINK! But that’s where it ends. Remember my protein smoothies for kids? Thanks for not judging me when I put frozen peas into a smoothie, by the way! I even crammed the power of grass-fed gelatin into some healthy fruit snacks out of desperation for my kid to consume protein. My kid eats by color, which is amazing. She adores green veggies, orange bell peppers, corn and purple tomatoes. But, the calories in vegetables aren’t nearly high enough for a growing toddler. I’m always looking for sneaky ways to get more protein in her diet. I’ve been sprinkling hemp seeds on her food lately, and she’s not resisting it! The last time I came close to making a healthy protein-rich snack that my daughter would beg for was my omega 3 chocolate energy bites. Heck, even I would beg for those! So good! And so easy! But last week, I developed this homemade vegan protein bars recipe. I used the power of hemp seeds for protein. 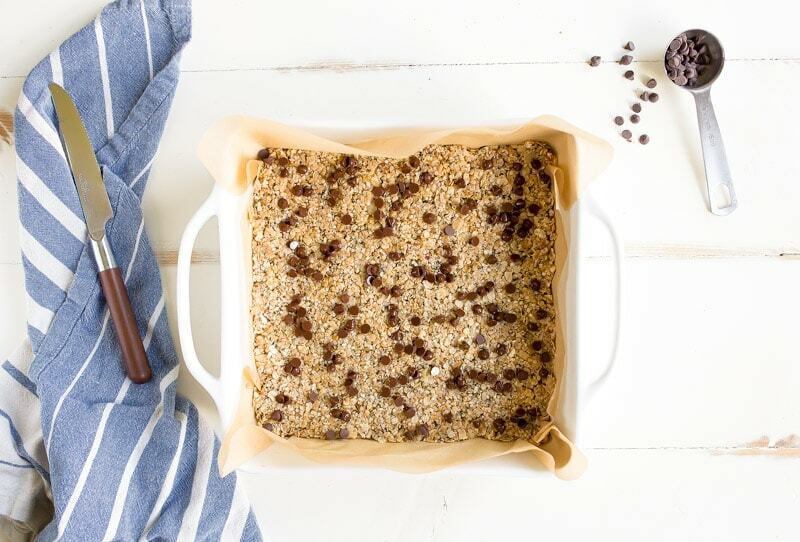 There’s a full half-cup of hemp hearts in these bars! Depending on how many bars you cut these into, 8 bars would give 1 tablespoon of hemp per bar, or about 3 grams of protein per bar! That’s a pretty good amount for not using protein powders, like most commercial bars do. I just learned from my friend Kacie that the number of grams of protein they need a day is equal to half of their body weight. 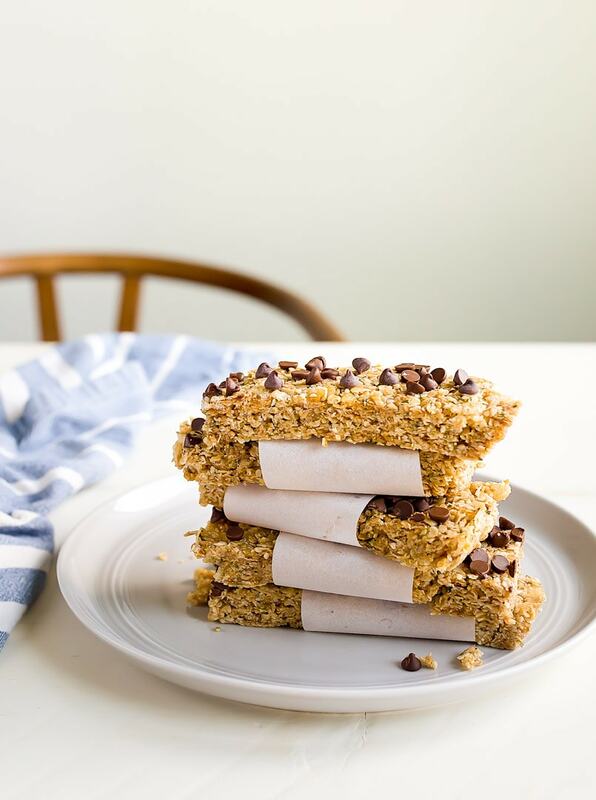 Camille needs about 15 grams of protein a day, and if she starts with a scrambled egg, enjoys cheese in her lunch, and these vegan protein bars recipe for a snack, she’s well on her way to meeting her goal before dinner. My little vegetarian babe! She’s happy because these bars are soft and chewy due to the rice crispies mixed with the quick-cooking oats. She’s also happy because I judiciously sprinkled mini chocolate chips on top. I’m filing these under my Baby Food Recipes section, but they’re so good that all the adults in this house ate half of the pan. Oops! The mini chocolate chips on top are entirely optional, but in my house, they make the disappear. I hope you love these bars, and enjoy that they are entirely no-bake! They pack great into a lunch box. 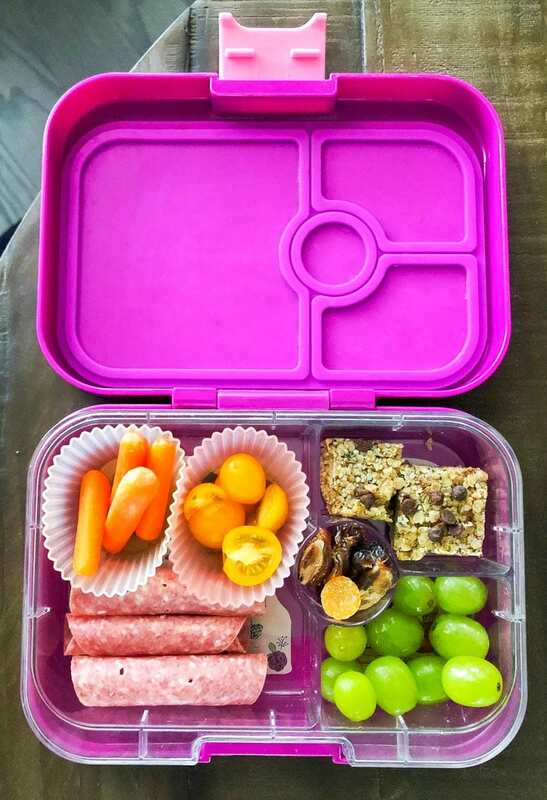 Here’s a sample of Camille’s lunch box that week that came home entirely empty! At first I was surprised she ate the salami since it’s meat, but then I realized it’s PINK, hah! Also pictured: baby carrots (she likes them with homemade ranch but I forgot to pack it on this day), baby tomatoes from our garden, and cotton candy grapes. The center circle has a cut-up pitted date, one prune and one gummy vitamin. I cut the vegan protein bars in half to make it easier for her to eat. If you have any secret ways to get your kiddos to eat protein, please let me know! 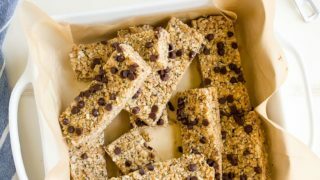 Homemade protein bars recipe with hemp seeds! First, line an 8x8" square pan with parchment paper, leaving excess paper on the sides to use as handles for removing the bars. In a small sauce pan, combine the coconut oil, honey and dark brown sugar. Heat over medium heat and stir until melted and homogenous, about 5 minutes. Remove from the heat and stir in the vanilla and salt. Meanwhile, stir together the oats, rice krispies and hemp hearts. Pour the coconut oil mixture over the dry mixture, and stir until well-mixed. Press the mixture firmly into the pan. Refrigerate the bars until set, about 1 hour. Slice into desired slices and serve. Store in the refrigerate for up to 5 days. Thanks! Excited to try these! These bars look yummy. I love throwing hemp hearts into anything I can…always in my morning cereal/yogurt fruit concoction. I also add a scoop of Vital Greens collegen powder…I too am looking to add protein to my diet and since I weigh a lot more that Camille, I needs lots of protein! Do you think it would work to add a scoop or two the Vital Greens to this recipe as an extra protein punch without changing the texture or consistency? Hi! Are they made with quick oats or rolled ? It says quick in ingredients list but you wrote rolled oats elsewhere . Is there a good substitute for the coconut oil? These are so good. And my children liked them. These are SO good. I made two batches this past weekend, one with honey (for me and my husband) and one with syrup for a true vegan friend. The honey ones held up a little better when I cut them, but the syrup ones did fine- just a couple pieces broke off. I sent a couple bars to work with my husband and he texted midway through the day that he LOVED them and wanted to eat the other bar. We’ll be making these again for sure. Thanks for sharing! Wow, I’m going to have to try these out on my boys. They look delicious so if all else fails, Mom has scored some sweet treats for herself. My little loves pancakes so we make banana pancakes… one banana, one egg and a bit of flour (or coconut flour) to stiffen them up. Naturally sweet so no syrup necessary and another way to use egg protein. We have also made cream of wheat with almond extract and then stirred it into eggs and cooked like a pudding. I call it breakfast pudding but again a way to up the am protein. I just made these today. So good. I mixed in the mini chocolate chips with good results too. I also have a confession…..we have no little ones in the house but I will be making these again and again. Thank you for sharing yet another delicious recipe. I used 1/4 Brown rice syrup and 1/4 cup Brown sugar and 3 tbsp nut butter plus added slivered almonds, pumpkin seeds with just a bit less oats and added raisins instead of chocolate chips and it’s so perfect and upped some nutrients with more seeds! They hold together just as Well! Love all your recipes and you are my go to site for all my baking these days! A stay at home mom can’t have piles and piles of cookies laying around!!!! Would you kmow the nutritional breakdown? Mainly for protein. Also, is there any seeds that have about the same protein as hemp seeds? Will make soon, need to pick up a few things. I don’t have the exact details (functionality coming soon on my site), but in the meantime, an online nutritional calculator will help you. Maybe chia seeds? Do you happe to know how much protein is in these? There’s a rough breakdown within the text of the post. But also, do you have a good online nutrition calculator that you use? Is it possible to use rolled oats?